April 21, 2015, 10:44 a.m.
By Joseph Lichterman @ylichterman April 21, 2015, 10:44 a.m.
Edward Roussel said it wouldn’t be an exaggeration to call this past year “the busiest 12-month period in The Wall Street Journal’s history” as the Journal has built out WSJD, redesigned fresh responsive article and video pages, and released new iPad and Android apps. That continues this week with the long awaited redesign of The Wall Street Journal’s website, its first since 2008, which launched today, and the release on Friday of the Journal’s app on the Apple Watch. But beyond new apps and redesigned websites, the Journal is integrating its product team into the newsroom and Dow Jones, the Journal’s parent, has created an innovation group, led by Roussel, who now has the title of Dow Jones’ chief innovation officer. “Until a year or so ago, the cadence wasn’t swift enough, and that’s what we’re seeking to put right,” he said. Processes that took months last year when the Journal was creating the first responsive part of its site, WSJD, now take weeks to accomplish, he said. The Journal’s product team will become part of the newsroom and designers will also sit among other editorial staffers. Through the recent redesign processes, the Journal has introduced an agile approach that emphasizes quick development cycles. The paper hopes that by moving the staffs together and onto one larger team it can reduce friction and encourage collaboration, Journal executive editor Almar Latour said. The Journal is only the latest of a number of newspapers who have taken steps to better integrate their newsrooms and development teams. By the end of the year there, for example, there will be 47 engineers working in The Washington Post newsroom, Post editor Marty Baron said in a speech he gave earlier this month. The innovation group, led by Roussel, meanwhile is looking at how the Journal will operate “12, 24 months out in this rapidly transitioning, mobile-led era and think about the products and services that we should be delivering and then start working on them now,” he said. He said they plan to look at ways to better personalize push alerts to make them more relevant to readers, Roussel said. Another area of focus will be live video on mobile, he said. The Journal, like many news organizations, is looking to boost its mobile metabolism as an ever larger percentage of its readership is reading the Journal on mobile. 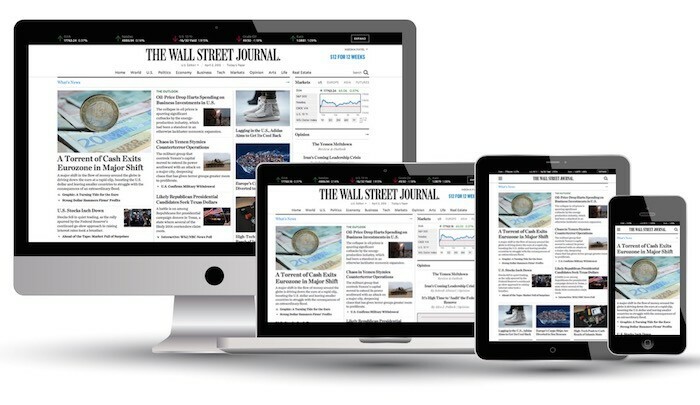 When The Wall Street Journal last redesigned its website in 2008, about 10 percent of its traffic came from mobile. Today, that’s at 44 percent, Roussel said. The Journal still wants to keep desktop users in mind — many subscribers come to the site during the day while they’re at their desks. (Cutting against the industry trend, the Journal’s homepage traffic actually increased last year, he said.) Still, mobile is an area of focus. Next month, the Journal plans to release updates to its iPhone and iPad apps that are aimed at increasing their speed and performance; the iPhone app will also get a visual refresh. On its Apple Watch app — scheduled to be released Friday when the first watches become available — the Journal is emphasizing the gestural nature of the device. If you’re looking at a headline on the watch and then tilt it in a certain way, the story will then be available in the Journal’s iPhone app. The app will feature top stories and market data. Users will be able to save stories to their iPhone with a tap or open up more of the story on the watch. POSTED April 21, 2015, 10:44 a.m.
Lichterman, Joseph. "After the launch of its long-awaited web redesign, The Wall Street Journal hopes to spur innovation." Nieman Journalism Lab. Nieman Foundation for Journalism at Harvard, 21 Apr. 2015. Web. 19 Apr. 2019. Lichterman, Joseph. "After the launch of its long-awaited web redesign, The Wall Street Journal hopes to spur innovation." Nieman Journalism Lab. Last modified April 21, 2015. Accessed April 19, 2019. https://www.niemanlab.org/2015/04/after-the-launch-of-its-long-awaited-web-redesign-the-wall-street-journal-hopes-to-spur-innovation/.